The Linde electric forklift truck from the 386 series is the most manufactured forklift of its kind. Today, the 111,111th truck is leaving the assembly line. A success story for two reasons in particular: the unrivalled versatility of the truck and the already legendary reliability. When the first E12-20 electric forklift trucks of the 386 series from Linde Material Handling were launched in 2006, the demand for the truck was enormous. With its overhead tilt cylinders, the decoupled chassis and lift mast, as well as a comprehensive ergonomics concept, it is even set to top the success of the previous model of the 335 series. In previous decades, the company had made a name for itself in the combustion engine sector in particular - hydrostatics is deeply embedded in Linde's DNA. Nevertheless, the signs of change emerged. "Our customers clearly asked for an ‘E’ product from Linde, which has a similar performance to a ‘V’ product, but that is free of emissions," says developer Wolfgang Hock, who significantly drove forward the start of production at that time. "The fact that the truck has been producing a steep sales curve for eleven years proves that our concept has been and is just right." The 386 has some features that ensure high performance: the two-engine front-wheel drive, which provides excellent traction control on gradients. The combination steering axle of the 4-wheel variant, which almost allows for turning in position and within the truck contours. The decoupled cab, which largely prevents the transmission of vibrations to the driver. The on-board charger for extremely easy battery charging. Since 2016, an additional lithium-ion version. And all this with numerous safety features and in an unrivalled model variety of 30 variants. This means that the forklift can be used anywhere – whether it be in the transport and logistics sector, in automotive and mechanical engineering or in the processing industry. The 386 series from the Aschaffenburg plant is used all over the world. What is most fascinating is that, apart from routine maintenance, the forklift in service is practically unheard of. "You can absolutely rely on it," agree customers. 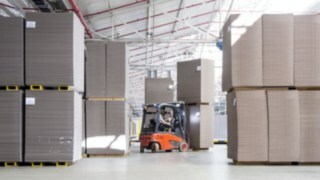 You can rely on them: a fleet of 386 series electric forklift trucks in use in the paper industry – here at the leading Polish producer of corrugated board, Werner Kenkel, in the Polish town of Krzycko Wielkie. 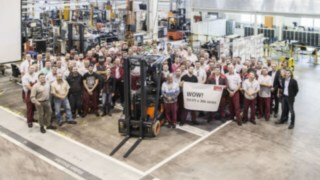 The anniversary in Aschaffenburg was not only celebrated by the employees on the assembly line. Employees of the first hour also expressed their congratulations, including Alexander Herberich. He supervised the start of production as a responsible foreman. "First of all, we had to familiarise ourselves with this completely new truck type. The hand grips were completely different from the other product lines. Today, however, we are on first-name terms with every screw," he says with a chuckle. Andreas Krinninger, Chairman of the management board of Linde Material Handling, emphasises: "At Linde, we are rapidly developing into a solutions provider for goods handling. However, this does not alter the central importance of the forklift for our business. We continue to put our entire expertise and our full passion into this. I am proud that Linde manufactures the world's most successful electric forklift truck series. We will do everything to keep it that way in the future!"